Santa may have his workshop where he cranks out all the toys, but over here I have my cookie shop going full steam ahead. I wanted to sit down for a moment to share some cookies with you and some tips that can turn you into a cookie-making factory in no time. I wish not a creature was stirring in this house; but I have all the girls home and extras too. 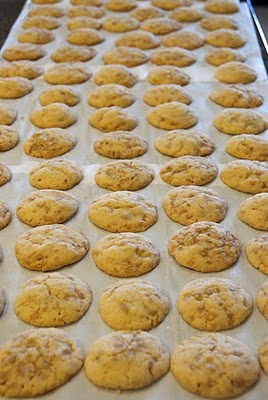 We are keeping ourselves busy; making sure there will be a plate of cookies left for Santa on Christmas Eve. I hope your preparations are going well and you aren't stressed at all. Grab yourself a cup of tea and enjoy some cookies with me. Find your recipes and check them twice. Be sure and stock up on all the necessary supplies. Make sure and make some old favorites everyone is looking forward to, such as chocolate crinkles, sugar cookies and toffee crackles. Have lots of containers on hand because you will want to share. But don't forget to make the ones you have been waiting for all year long! I've had this recipe for so long I'm not sure where it came from, but it's my favorite cookie at Christmas time. Save yourself lots of clean up time and have this in your drawer. This is my secret weapon when it come to rolling out sticky dough. In a food processor bowl, combine flour and salt. Cover and process until mixed. Add the butter and cream cheese; process until well combined. (Or use a mixer). Divide dough in half. Wrap in plastic wrap; chill 1 hour or until easy to handle. On floured surface, roll dough, to 1/8 inch thickness. Cut out cookies with a 2" heart shaped cutter. On half of the hearts, place scant 1/4 tsp. of preserves and a small amount of almond paste on the center of each heart. Combine beaten egg and water. Brush cookie edges with egg mixture. Top each cookie with a plain heart cutout. Lightly press edges together, then seal with tines of a fork all around edges. Brush finished cookies with egg mixture, then sprinkle with coarse sugar. Place on an ungreased cookie sheet. Bake in 375 degree F oven for 10-12 minutes. The girls started calling these puffy hearts a long time ago, maybe you can see why! I've got our plate all ready for Santa to come; hoping you do too. Well it's back to the cookie mines for me. Wishing all of you Happy Holidays, Merry Christmas or whatever that may be. Impressive! You have been a very busy baker. Love the pastry hearts - they look super tasty. Happy Holidays! what a great idea!! And let me say that I can personally attest to the fact that all of your cookies were delicious!!! I think you must have been an elf in previous life! Lovely recipe. Merry Christmas & Happy New Year to you and your family! I'm kind of happy this year Xmas is my hubby and I only....I feel I have less to stress out....and there are more cookies for us. In fact, I think these pastry hearts are just what I needed to finish our cookie tasting of the season (i love pastry!). Merry Xmas Gina! Oh Gina those are perfect! I just love it! Have happy Holidays! Santa will be over at your house, Gina, not once but many times for this puffy hearts cookies! But oh, tons pink ones you put out on the plate would surely make Mrs. Claus jealous? ;-) This is such a gorgeous cookie, and you have such a wonderful cookie factory complete with lovable elves who are your girls! Have a Merry, Merry Christmas to you and your familia, Gina! OMG I WANT TO MAKE THESE COOKIES!!!! I have so much I am already making today but I HAVE to squeeze this in! Either today or tomorrow morning. They are so freaking cute!! We love us some pastry and filled with preserves? My German guests will love that! Merry Christmas to you, Gina! Mmmm, these filled pastry hearts look delicious! 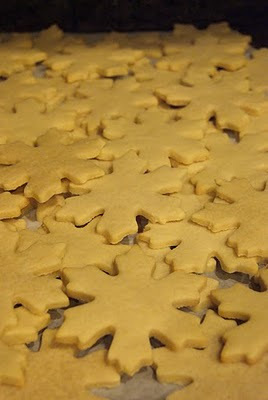 I cannot believe how many Xmas cookies you make, I am astounded! Gina, these pastry hearts look marvelous! Gina-What a "cookie heaven"...Just bring a lot of cookies and be my guest for Christmas, in South Florida...you've seen my photos, and it's all true! Plenty of sunshine, and perfect weather. In any case...Buon Natale-Merry Christmas, to you and your loved ones! I wish I lived next to you, I'd gladly eat many of your delicious looking cookies! mmmm! The pastry hearts are so adorable and such a great idea. I love almond paste, so I just love that you filled them with almond paste and jam. YUM!!! I hope you have a Merry Christmas Gina! Thanks for the helpful hints! Your filled pastry hearts also look amazing, so cute with the sprinkles! cute little hearts and an impressive stack of butter. I'm at relatives and have done ZERO cooking. My little one has also been very poorly over Christmas and only beginning to feel a bit better today. He's already found the flour and sugar in Nanny's cupboards today - so we might need to do some baking soon ! These all look so delicious. I love cutting heart shapes into my cookies and pastries...and I love butter. We go through quite a bit at my house!Thank you for sharing all that you do. I hope this week is full of blessings, joy, hope and love! Your pile of containers look like the one I had before Christmas. It seems like my kitchen is indeed a cookie factory for a week or so before the holidays. It's a relief to have that work over with. I think those pastry hearts sound wonderful and I love how you can change the look simply by changing the colored sugar on top. Beautiful, beautiful hearts Gina!! And I laughed out loud at the butter pic!! Here's to butter season!! I hope you had a fabulous Christmas Gina! Your pastry hearts look melt in your mouth delicious. Gina, I must say that I absolutely love your hearts!!! So pretty and delicate and with a surprise in the center. Wishing you and your family a very happy New Year! Gina, your little pasty hearts are just so adorable and they look super tasty too! They look like they would just melt in your mouth! Wow, you should do another post on how to prepare for the holidays! I can't believe your cookie baking stamina. And I'd like to add my name to next year's cookie recipient list please :) Happy holidays Gina! Hi Gina, you are a cookie machine:) I can't believe how much baking and sharing you do, how lucky are the recipients of your cookies. I love your pastry hearts, these are going on my cookie list. Have a great new years eve! Wishing you a most fantastic New Years! Gina- You and the rest of your elves did a magnificent job on all of those cookies, dozens and dozens, and the butter! You saved the best for last, the pastry hearts. Now you have a jump on Valentine's Day!